The official launch, a few days ago, follows the announcement early in June. 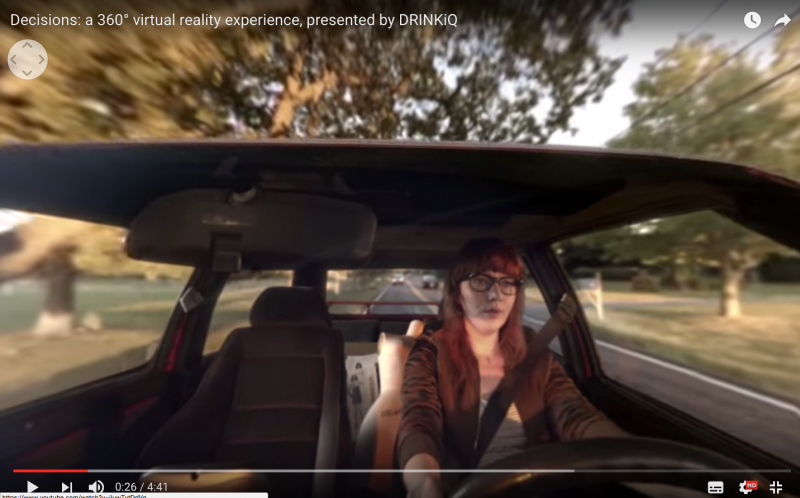 Diageo, a corporation including brands such as Smirnoff, Baileys, Johnny Walker and Guinness launched a virtual reality video called “Decisions” that aims at convincing consumers not to drink and drive. The video lasts little over 4 minutes and shows three cars. In one there’s a young couple of parents going out (their baby is back at home with the baby sitter); in another there are three friends going to a party (and drinking on the way) and in the third there’s a young professional who has just got a new client. She was celebrating with the client and some colleagues and drank a little too much – so much so even a friend on the phone asks her if she really feels like driving, but she says she’ll make it. It’s easy to imagine how the plot will end. What’s interesting is that, as often in similar projects, the anti-hero is not an alcoholic with whom it’s harder to relate. The anti-hero is “just” a person who, as an exception, has drunk more than usual. Perhaps because of peer pressure (and this applies even more to younger consumers). This, in terms of narrative, is the most interesting aspect because it’s easier to put yourself in the protagonist’s shoes, and not think “well, I would have never done that”. After all, at some point or another we all have done something silly. Like toasting to a big celebration with a little too much wine. What changes is the choices you make after that. Putting the narrative aside, the real innovation is the virtual reality. It is not the first time, after all, that a producer of alcoholic beverages decides to invest in awareness projects. A company’s social responsibility in this industry also implies reminding consumers they shouldn’t drink and drive. What’s different compared to similar projects from the past is the fact they used VR (virtual reality) technology. In fact Diageo will organise awareness events during which participants will be able to view the video with VR headsets, sitting on special chairs that will move following the film. And to make the film accessible to all, the video was also launched on Facebook 360, YouTube 360 and a VR app created in collaboration with The New York Times. It is also compatible with normal VR headsets, such as Samsung Gear VR, Google Daydream and Google Cardboard. And since I had a VR visor at home as well (one of the advantages of living with a geek) I watched the film the other morning. Once you put the headsets on, it feels like you’re sitting next to the person driving (except at first, when the characters are introduced, and throughout the film in the case of the two parents – you basically watch them from the bonnet). The choice of putting the viewer next to the driver has a precise meaning: stopping a person from drinking and driving is also up to you. And since it’s a 360° video, throughout the film you can turn around and see the scene from different angles. In other words: you’re sitting in the car and can look at those beside you, you can look behind, in front, above. The scene, at the time of impact, is focused on the person who’s drunk too much, even as the car rolls to a side. Perhaps it could have been stronger, and I see why they want to use special chairs during related events. Still, when I took the car about half an hour later I must admit I was looking around with even more attention than usual, as I was driving. And I hadn’t had a drop of wine. According to some charities that fight drinking and driving, the video could have been stronger. Perhaps they were right but at usual any project that might create even the smallest improvement in people’s behaviour must be appreciated. You can watch the video on Youtube, even if you don’t have the headset, moving around the scene with your mouse. It’s less immersive but you get an idea. If instead you’re geek too, deep inside, without spending too much money on the Google Daydream headset (which has a great design and is wrapped in fabric though it functions just like a cheap unbranded plastic version), you can find headsets on Amazons for around 20-30 euros.